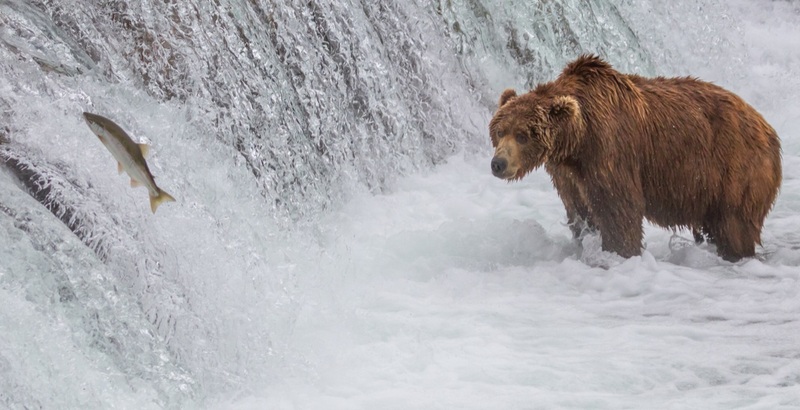 Canada is wildlife central, and British Columbia arguably has the most diverse species on offer, from green herons and grizzly bears to orcas and trumpeter swans. Fall is a wonderful time to watch wildlife because it’s not too hot, the aspens have just started accenting the evergreen forest with yellow and gold, and the air takes on an inviting crispness. Just be sure to keep your distance from wildlife— 30 metres (98 ft) minimum, and even further, at least 100 metres (328 ft), from predators such as bears. Go wildlife watching early or at dusk when animals are the most active. Here are some of the top spots to see BC’s incredible critters. Autumn is peak grizzly season on the wild west coast, and fly-in Knight Inlet Lodge is a great place to see them. The Glendale Cove area has one of the largest concentrations of grizzly bears in the province. Situated 80 km (50 miles) north of Campbell River, the conservation-minded lodge focuses on safe viewing in the bears’ natural environment. 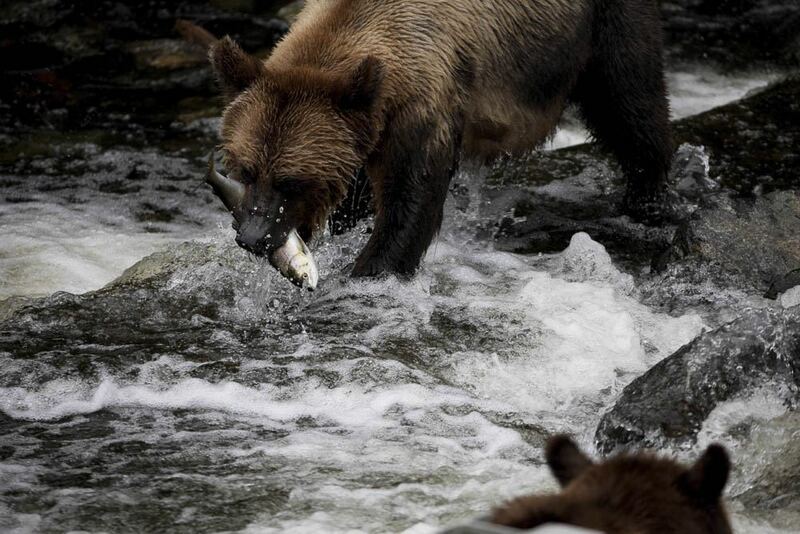 You might see some of the 50 grizzly and black bears feasting on salmon within a 10-km (6-miles) radius of the floating wilderness resort, which is specially designed for optimal animal observation. You can also go sea kayaking along the pristine rainforest coast, take a marine wildlife tour, and whale watch until mid-October. Pack a zoom lens! The story is iconic: wild salmon begin the arduous journey from the ocean back to where they were born, to spawn at the main stem of the Fraser River each year from late September to early November. It’s one of the planet’s largest salmon runs. You can see all five Pacific salmon species, too, on the 1,375-km (850-miles)-long waterway. If you’ve never seen the battered, crimson-hued fish fighting their way upstream, especially when they get to the shallow northern streams at the end, it’s a stirring sight. And of course, the spent carcasses attract hungry bears, eagles, and gulls by the thousands. If you want to learn more, visit one of the hatcheries near Vancouver: Chilliwack River Hatchery, Abbotsford’s Fraser Valley Trout Hatchery (which also has steelhead and cutthroat), or the Capilano Salmon Hatchery in North Vancouver. 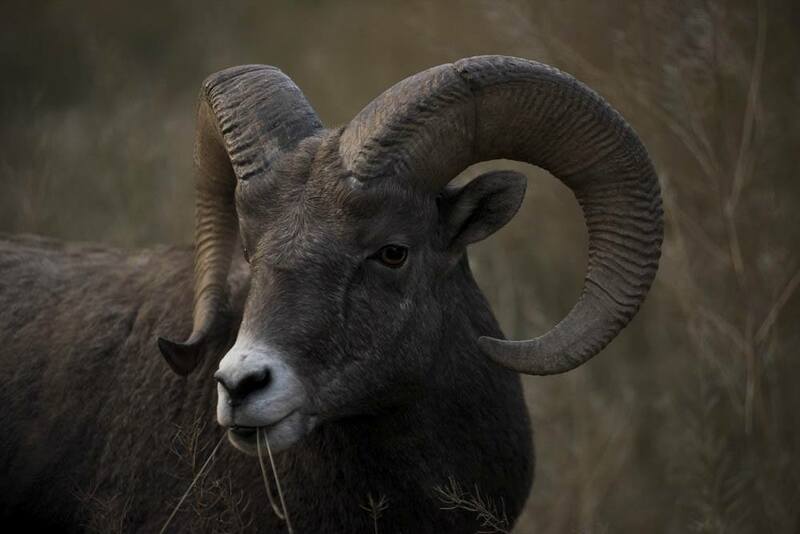 You can see bighorn sheep in spring and summer in the Kootenay Rockies at Radium Hot Springs, but the real drama unfolds in fall: rutting season, October into November. That’s when the rams of the 140-strong herd convene in town and start clashing, literally, for hours at a time in competition to win female attention. The 300-lb (140 kg) bachelors taunt, kick, and then charge each other at 35 kph (22 mph), rising on their hind legs to bash each other’s 30-lb (14-kg) horns with incredible force. The sound? Like a sledgehammer — so loud you can hear the crack a mile away. In early November, there’s a two-day Headbanger Festival with tours and seminars showcasing the annual event. After the show, soak in Canada’s largest natural mineral hot springs. Moose? You’ll want to head to Prince George, home to the highest density of these hooved giants in North America. 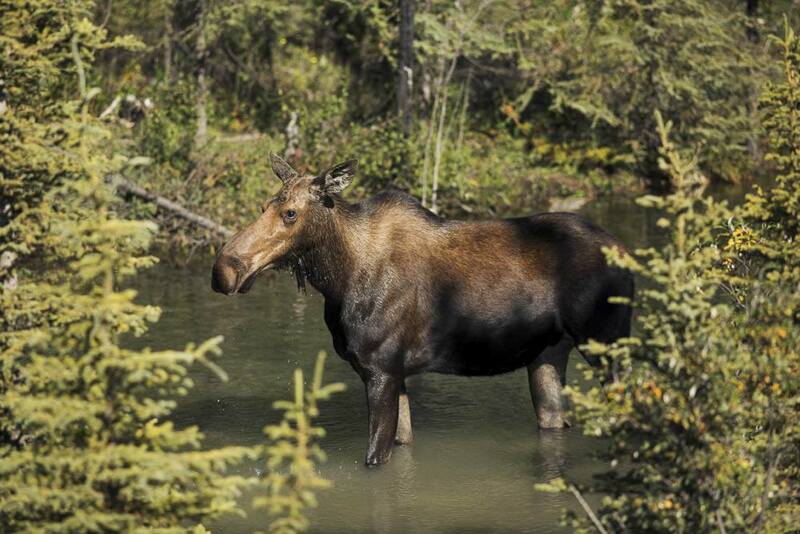 In fact, 70% of the province’s moose live in Northern BC. Grown bulls with impressive sets of velvety antlers stand some 6.5-ft (2-m) tall and might weigh 1,100 lbs (500 kg). Late fall is rutting season when the usually solitary ungulates gather in groups of eight to 10 and lock horns. Listen for the cows’ loud, moaning call designed to lure a mate, and take care because moose can be aggressive at this time of year. Look for moose in clearings and valleys; they prefer open spaces with plenty of shrubs and brush to munch on and marshy areas surrounding lakes, and are easiest to find in the early morning. Try either Highway 97 from Pine Pass to Old Friend Creek or Highway 16 from Prince George to Valemount in the southern Rocky Mountain Trench. Another option is canoeing the Crooked River just north of town or in Bowron Lake Provincial Park.